This month turned out to be short story month. I'm not a big fan, but for various reasons, I read 3 short story collections, with varying degrees of success! I also read much more than usual, and quite a few good ones! This is my favourite romance ever and I reread it every couple of years. And every single time I'm surprised by just how brilliant it is. 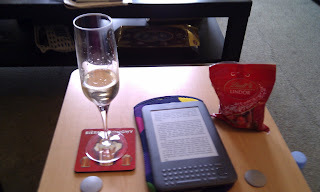 By the way, this was part of what I called my Decadent Easter Sunday: small bottle of champagne (well, it was actually a Luxembourgeois crémant, but that's close enough), Lindtt mini-Easter eggs and Lord of Scoundrels on my Kindle. Bliss!! A teenager witnesses something that puts her under police protection, with the entire Russian mafia after her. 12 years later, the reclusive and secretive Abigail Lowery attracts the attention of small-town police chief Brooks Gleason, a man who can't resist a secret. I loved it. Loved the romance, and I was really gripped by the suspense, which didn't go in the direction I expected! The first collection of short stories. It was thrust on me by a friend who's already given me 3 books that REALLY weren't my thing. It was a relief to read the first story and know within 2 pages that I'd finally be able to tell him he'd hit on a good rec! The word for it really is "lovely". Lovely, charming, beautifully written, low-key but powerful. It was all those things. Road romance, second in the Spindle Cove series. I haven't read the first one, but that didn't matter at all. We have here a plain, bluestocking heroine and a supposedly useless and rakish hero who's the only one to see below the surface. I loved it. The plot itself is a bit improbable and the characters' behaviour will probably strike many readers as a bit modern, but for me, it was a case of a good author being able to make me suspend disbelief. This is Brockmann trying something a bit new, characters with superpowers set in a dystopian-ish near future. Not too new, though: it's still very much vintage Brockmann. There's several couples and their stories, the hero of the main romance in this one is a Navy SEAL and it's not too subtle about its politics. I liked it, but if I didn't share Brockmann's politics, it would probably have annoyed me. YA fantasy. Averie is a girl from a military family, travelling to join her father and fiance in a newly colonised country. She's never given a thought to the rights and wrongs of what her country gets up to around the world (think 19th century Britain), but her experiences in Chiarrin open her eyes. I was left wishing this was not YA, but it was very good. Fantastic setting, and a jaw-dropping ending, in the best of ways. Milan is really good at novellas, and this one delivers. The hero, Hugo, works for a duke, as a cross between man of business and enforcer. The heroine, Serena, has been wronged by the duke, and is determined to get her own back. Hugo is assigned to make her go away. Obviously, things don't go as expected. I really liked this, it's quite dark, and I liked how Milan balances the dark side of the power of the aristocracy over regular people and the romance genre's need to have heroes who are powerful. The second collection of short stories this month. This one I read after it was mentioned in several of my book podcasts. The idea of ghosts and the supernatural in a Cornwall setting intrigued me, and the collection satisfied these expectations, but only about half the time. I loved a few stories, and found them haunting and fresh and clever, but there were also several I didn't get at all, which kind of annoyed me. First in the Burgundy Club quartet. I quite fancy reading the 2nd, 3rd and 4th books, so I thought I'd start at the beginning, with the story of a widow who owns a bookshop and the rakish nobleman who hires her as an advisor to purchase a rare book at auction. It was a bit meh. I did love the rare books angle, but the romance didn't engage me at all. The hero and heroine, who have a history, are forced to pretend they're a couple for the sake of a business deal. Some original elements, and I usually like the stuffed-shirt hero / lively heroine pairing, but it wasn't particularly well-done here, and the contrived stuff was, well, contrived. This final short story collection was my April reading group book. Allende is an author I've really liked before, but this one, I hated. And I'm not using the word lightly, I genuinely and violently despised it. Mainly it was the offensive worldview and language, juxtaposed with the twee and whimsical way it was written in. First in a fantasy trilogy. The heroine's mother was cast out by her powerful ruling family, but now that she's dead, the patriarch of the family has commanded the heroine to come back, intending to name her as one of his three potential heirs. The rub, however, is that only one can inherit, whichever one can survive being basically hunted down by the other two. I really liked how the worldbuilding (the mythology, especially) was shaping up, but I was struggling with the author's voice, which I seriously didn't like. I dropped this one at about a quarter in. Started out well. Set in the 20s in a house party at a "talkie-mad" Earl's estate, it looked like fun, but the characters descended into caricature and stupid behaviour after some 100 pages. I was tempted to put it down by several things, but what sealed the deal was the dialogue of an Italian character. Annoying to the point of being offensive. I've only just started this one. It was Brockway's first contemporary. So far I'm not quite sure what I think, it's a bit zany and surreal: the heroine is 17 at this point, wearing a pink ball gown, bangs standing on end (like a breaking tsunami or a Japanese woodcut, the hero thinks), competing for the Miss Buttercup title and about to have her head carved in butter. We'll see. 3rd in the Monkeewrench series, which I love. So far, so good. Mysterious happenings -3 bodies fished out of a pond, killed by automatic weapons, execution-style, and a whole town which has succumbed to something lethal. No idea what's going on, and I can't wait to find out. Have you read Shinn before? I just love her books. It was one of the angels short stories that you liked, right? You know, even though you didn't like Archangel, I'd suggest you try the next one in the series, Jovah's Angel. It's very different, and it takes place about 150 years after Archangel, so you see none of the characters from it. Plus, it has some really mindblowing revelations. Just don't read any blurbs, they often have spoilers and you really, really want to go into it blind!